KawaiiPunk - Kawaii Mascot Blog: Perfect Partners Puzzle! Sneaky Mascot! Pretty sneaky, huh? But wait, in her haste to snag the free cupcakes Sneaky has gone and dressed up in the same outfit twice! Guess cheats really don’t prosper after all! 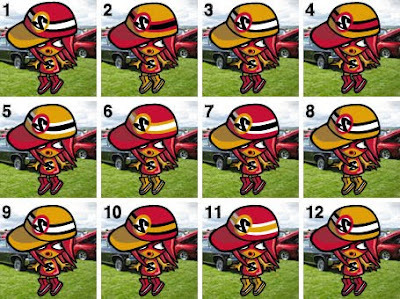 Can you the spot the two identical Sneaky Mascots and help foil her diabolical cupcake caper? The answer will be revealed in this month’s monthly round-up!